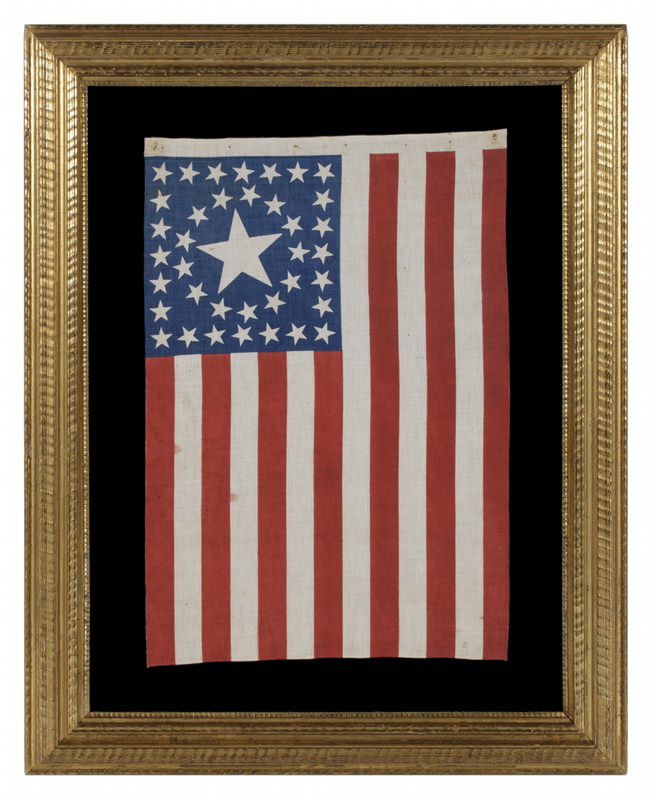 Frame Size (H x L): 35.25" x 27.25"
Flag Size (H x L): 24.25" x 15.75"
38 star American national parade flag with an especially rare type of medallion star pattern. This consists of a huge center star, surrounded by a wreath of stars, contained within a square of stars that follow the perimeter of the square canton. Significantly more rare than the equally beautiful “Great Star” pattern (a star made out of stars), the circle-in-a-square pattern is one of the best geometric designs across all star counts. Flags in this basic pattern are so scarce that even major collectors like Boleslaw Mastai, who wrote the first major text on flag collecting and owned more than 500 examples, never acquired one. Circle-in-a-square patterns are known in only a tiny handful of star counts. Among pieced-and-sewn flags, the design is next-to-unknown. I can recall just two, both of which I bought and sold nearly 20 years ago, including one flag in the 21 star count and another with 34 stars. 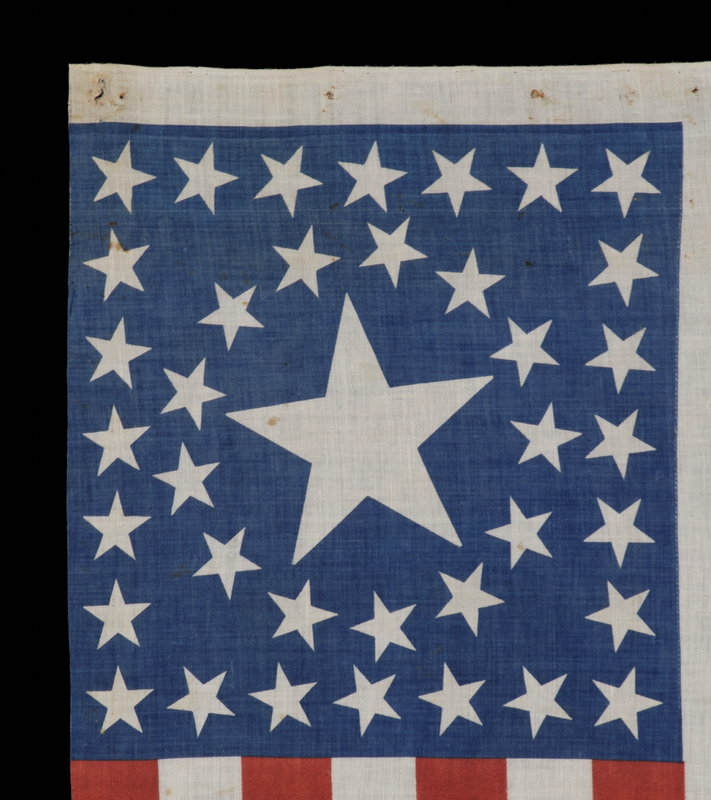 Among printed and clamp-dyed flags the pattern was most popular in the 38 star count, with the only two known designs both dating to 1876, made specifically for the centennial of American independence. Of the two 38 star variants, this one, printed on cotton, is the most rare, with approximately 5 or 6 copies extant. This was the first to surface and, for many years, the only one known. 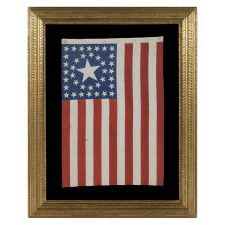 I sold it to collector Richard Pierce close to 20 years ago and it is illustrated on page 28 of his book, "The Stars & The Stripes: Fabric of the American Spirit" (published by Richard Pierce, 2005). Not only was this the first copy of this flag to come to the marketplace, but it remains the best of those that exist today in terms of condition. Because the red dye is not colorfast, and is subject to more aggressive fading, if not protected, only one other in this style survives in a desirable state of condition. The flag was so well liked by Pierce and others, myself included, that it was selected as the frontispiece for posters and ads for his earliest book signings. It is of interest to note that a period child's dress known, made entirely of numerous copies of this flag, that were clipped into fragments (none of them complete) and sewn together, to be worn for the 1876 celebrations. I am in possession of an image of the granddaughter of a flag collector actually wearing the dress, taken at a time before he knew how valuable it was. When I received the photo, requesting my opinion about the value of the dress, I practically fell off my chair. "Well," I replied, "if the flags were complete…"
Colorado became the 38th state on August 1st, 1876. 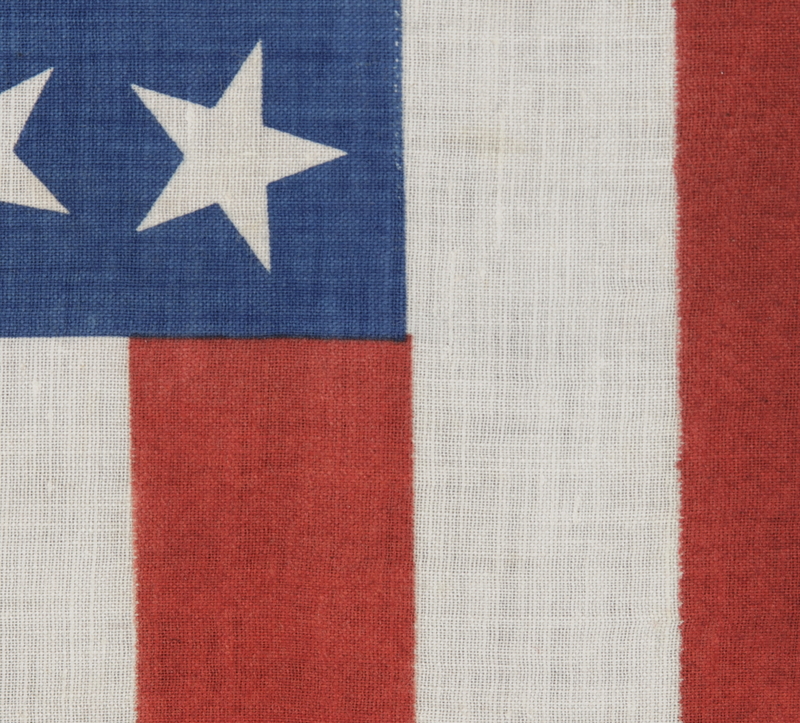 Per the Third Flag Act of 1818, stars were not officially added until the 4th of July following a state's addition. For this reason, 37 remained the official star count for the American flag throughout that year. 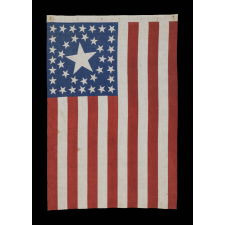 Because flag-making was a competitive venture, few flag-makers would have continued to produce 37 star flags when their competitors were making 38’s. It is for this reason that 38 and 13 stars (to represent the original 13 colonies) are more often seen at the Centennial Expo. Some flag-makers would have been adding a star for the 38th state before it even entered the Union, in the early part of 1876 or even prior. In fact, many makers of parade flags were actually producing 39 star flags, in hopeful anticipation of the addition of two more Western Territories instead of one. But the 39th state would not join the Union for another 13 years, when the Dakota Territory entered as two states on the same day. 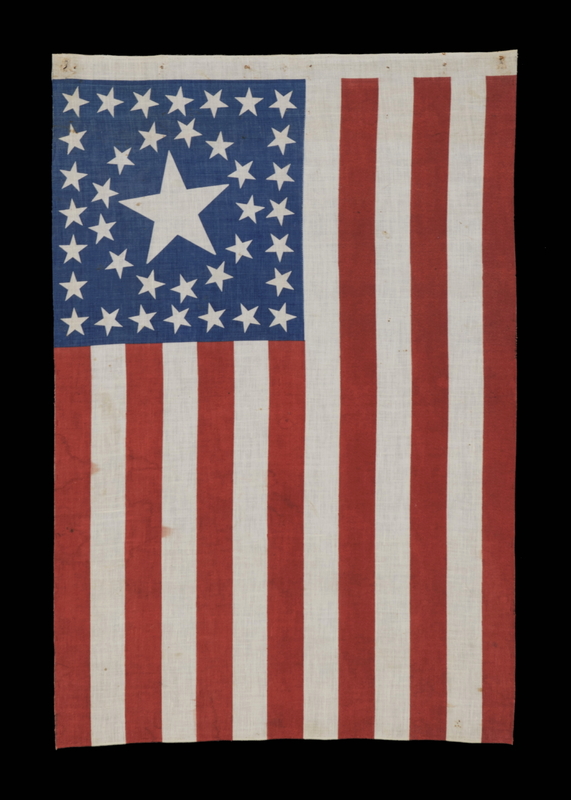 The 38 star flag became official on July 4th, 1877 and was generally used until the addition of the Dakotas in 1889. 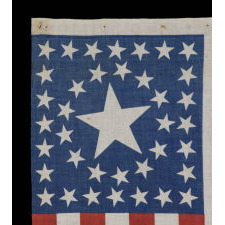 In summary, this is one of the very best designs known in flag collecting, with striking colors, on one of the rarest flags made for an important event in American history, acquired by a major collector, featured in his book and used in some of his earliest promotional campaigns due to its beauty and importance. 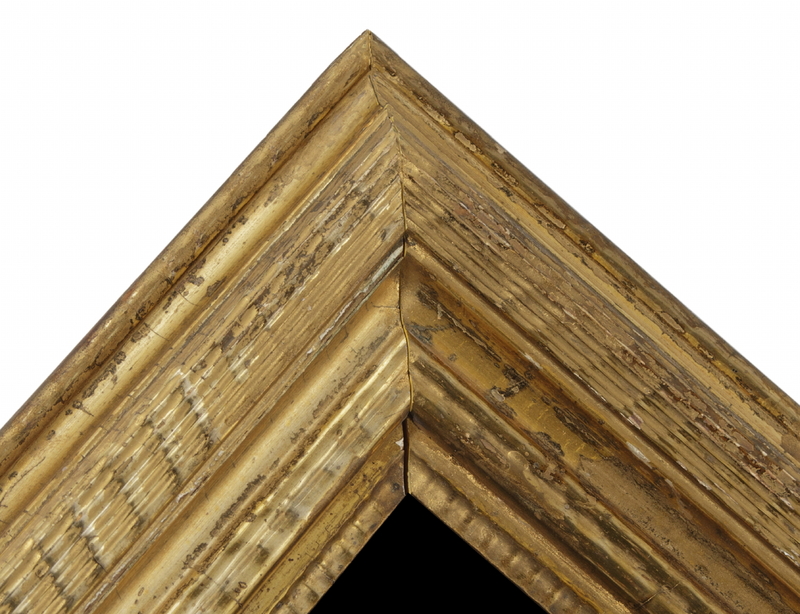 The gilded, American molding has a rippled profile, dates to the 1830-1850 period, and is of exceptional quality. The background is 100% cotton twill, black in color. 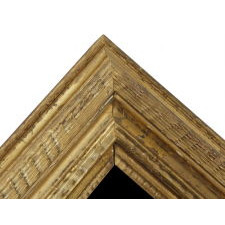 Spacers keep the textile away from the glazing, which is U.V. protective glass. Feel free to contact us for more details. 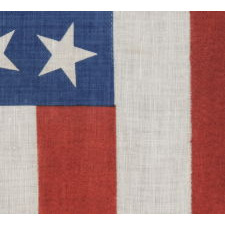 Condition: There is minor bleeding and minor water staining, and there is a series of tiny rust stains along the hoist, where the flag was once tacked to its original wooden staff. Many of my clients prefer early flags to show their age and history of use. This is the best condition among flags known in this style, the rarity and desirability of which warrants almost any condition.